Handwritten crafts small lot wines that evoke a sense of place from which they come. With a focus on high elevation, hillside and mountain fruit, our 2,000 case production is spread across 5 district Cabernet Sauvignons and accompanied by the other notable Napa varietals. Join us for a Tale of the Terroir Tasting. Handwritten offers comprehensive sit down tasting hosted by our certified wine educators focused on exploring our small-lot, hillside and mountain Napa Valley District Cabernet Sauvignons. We source from Rutherford, Oak Knoll, Oakvill, Stags Leap, Calistoga, Coombsville and Carneros. We also feature two white wines, our proprietary “The Author” Sauvignon Blanc, Carneros Chardonnay, and a Sta. Rita Hills Pinot Noir. These tastings are hosted at our "Pop-Up" at sister Winery Jessup Cellars in Yountville, California. For those seeking a once-in-a-lifetime wine country experience like no other, we also offer an exclusive farmhouse experience. These appointment only tastings are available 7 days a week at 10am, 12pm, 2pm & 4pm. Farmhouse experiences tend to need at least a week’s notice and are subject to availability. To book an appointment, please reach out to us at wine@handwrittenwines.com or by calling Emily Wilkens at (707) 944-8524. To join the wine club, visit www.handwrittenwines.com or call 707-944-8524. 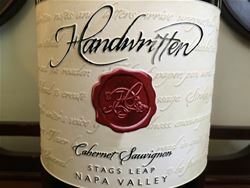 Handwritten Wines is certified under the Napa Green Winery Program by the Napa County Department of Environmental Management (DEM) and the Association of Bay Area Government’s (ABAG) Green Business Program and completed all the regulatory components needed for environmental sustainability. These components included developing water and energy conservation methods, preventing pollution, and reducing solid waste. In addition to developing sustainable winery practices, this program is set to become the standard for the state of California. Handwritten Wines is certified under the Napa Green Certified Land Program. Handwritten Wines has created and implemented a customized farm plan with measured results that addressed all aspects of its property, vineyard land as well as non-farmed land, including practicing soil conservation, water conservation, stable drainage, riparian corridor enhancement, fisheries and wildlife habitat enhancement and long-term improvement and sustainability.